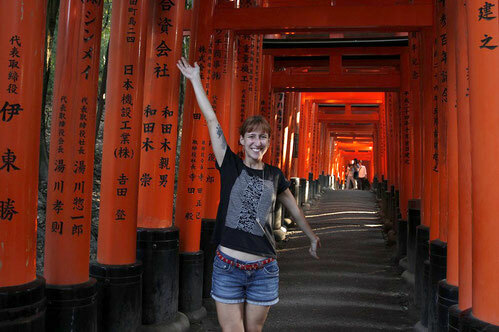 Fushimi Inari: Stairway to Heaven. I’m falling headfirst into a dark red atmosphere. My hands are touching the painted wood piles. Black Japanese calligraphy is carved into them. Every character looks like a mysterious and subtle artwork. In front of me more than one thousand red, orange and pink Torii are winding up through the forest to the top of the hill. In between you can find stairs, little pagodas and fox sculptures. 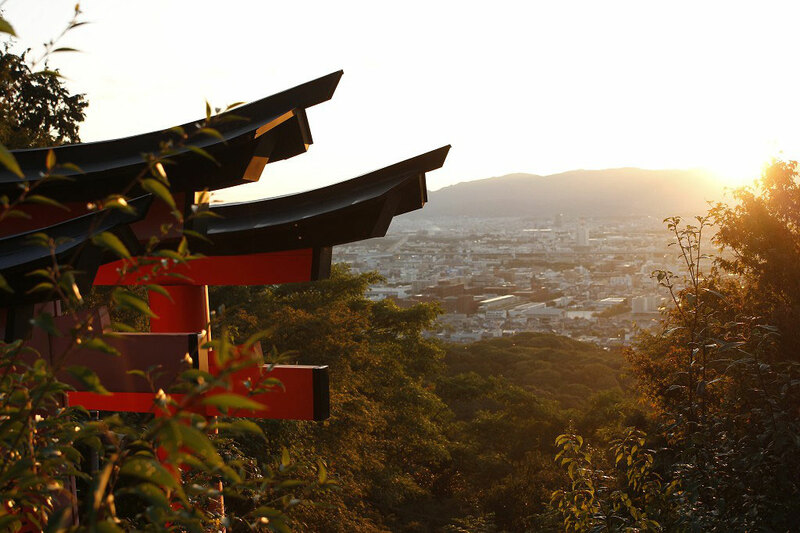 We’re going up far beyond the rooftops of Kyoto to meet the sundown. 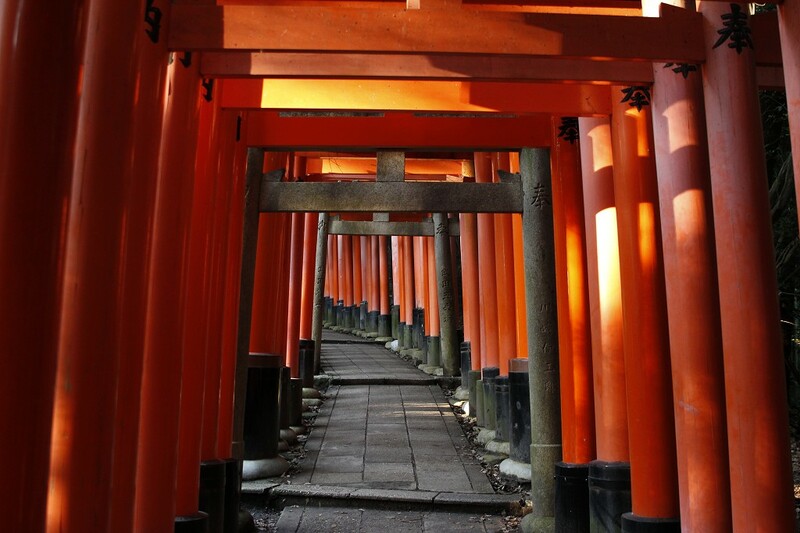 Fushimi Inari – a man-size mystery. When you are traveling Japan you won’t be able to miss them: Torii. Most of them are marking the entrance of a shrine. They are made out of two rails. The upper rail is lying on top of the vertical joists and the lower rail is cutting them. 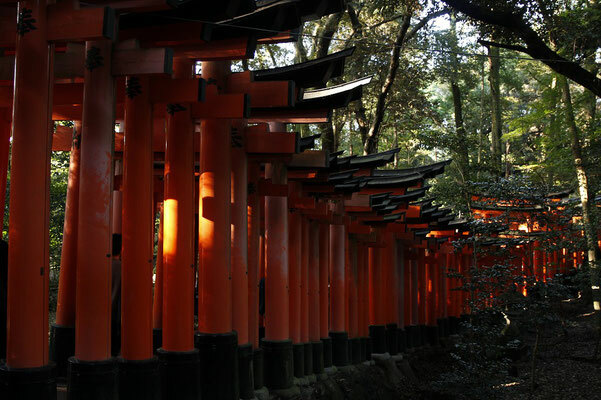 To see at least one single Torii makes you feel a special spiritual atmosphere. At Fushimi Inari-Taisha in Kyoto you can find more than one thousand of them. We are crossing them like an endless tunnel. 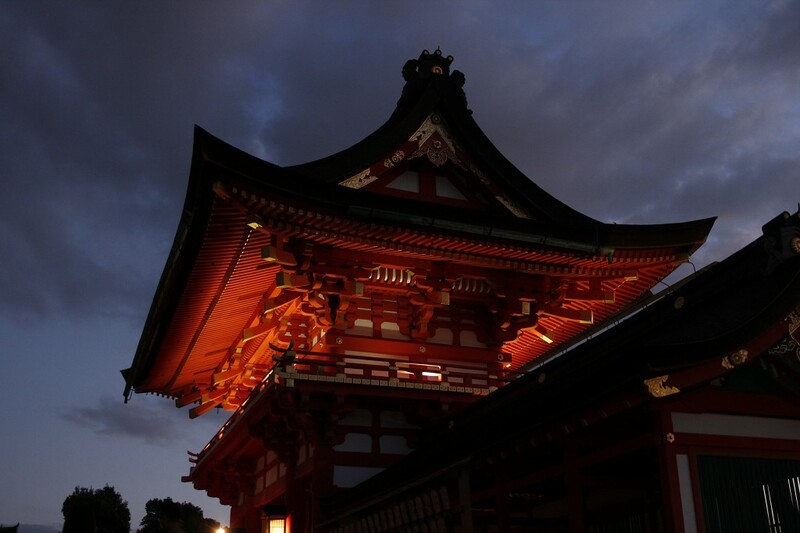 The shrine is one of the most popular and beautiful ones in Japan. It’s dedicated to the Shinto-God of rice. One thing is clear: I had no idea of the amount of gates. So we are walking up the wooden alley in a good mood refusing temperatures around 90°F and a humidity of a hundred and fifty percent. It takes you up to three hours to climb up and down the hill. I read about that fact later in my guide in our Airbnb after I downed some gallons of water to get on with my life. Very informative! So we are hiking fascinated step by step through the magical aisle. I’m taking several breaks to touch the Torii and feel them. Let them come to my mind. To realize that everything is real. That I am where I am. It’s hard to believe it in a place that is so far away from all the ordinary architecture in the world. 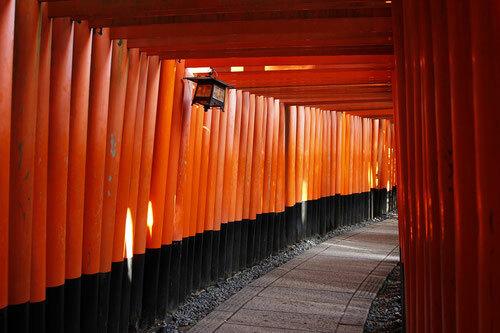 Fushimi Inari was built before 794. Take a moment and think about this age. I got dizzy. Or I maybe just got dizzy because of dehydration after I climbed up the next one hundred stairs. No, I’m pretty sure it was because of the year 794! Some months later we are reaching the top of the hill. Sunset light is stroking the peaks of the mountains piling up behind the city. The home of more than 1,4 million people is covered by a warm and misty atmosphere. So we are simply enjoying the beautiful sunset drenched in sweat but still more than delighted before we are going to march down again. You can reach Fushimi Inari by taking the JR-Train. Get off at the station called “Inari”. You can also take the Keihan Main Line by exiting at “Fushimi Inari”. 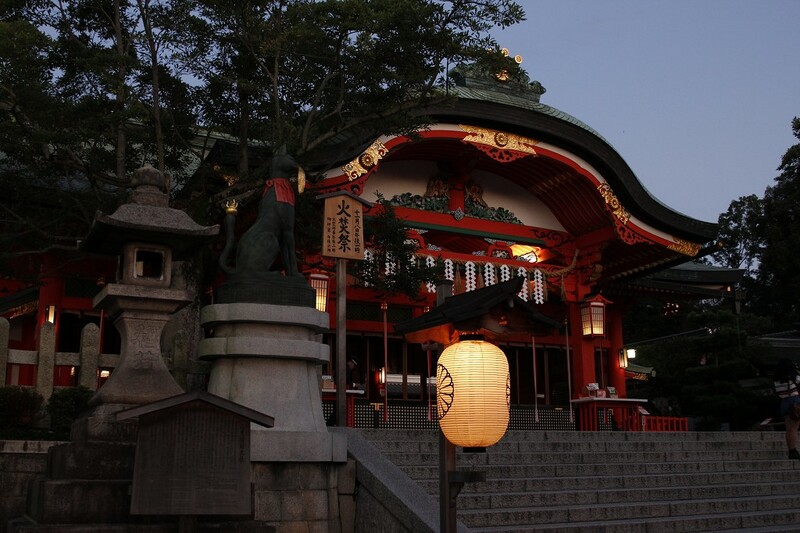 From both stations it is easy to walk to the shrine that it located at the bottom of the hill and also very beautiful. The way from the JR-Station is even more attractive because you’ll walk along hundreds of lanterns before you’ll reach the shrine. Bring enough time and water! To me the best time to visit Fushimi Inari and to walk up the hill is round about two hours before sunset. The light is amazingly reddish and there won’t be too many people (but still many!) 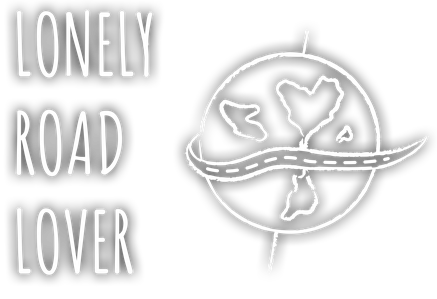 anymore. At the end you can enjoy a beautiful view over Kyoto before it gets too dark.